The 2017-19 residents are off to a fast start. As soon as they joined us in mid-August, they received an intensive orientation to church policies and procedures—a detailed look at how things work at First Pres. One of them likened this early experience to "drinking from a fire hose." As we move into Fall, they are enthusiastically engaged in a full range of parish duties. 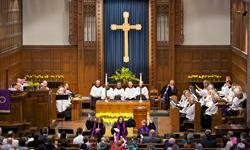 All contribute to worship leadership, and each of them preaches regularly at 8:00. Under Jay Sanderford and Fairfax Fair’s guidance, residents explore all aspects of worship, sharpening their skills as preachers and liturgists. Working with Melissa Ann Rogers, residents are assigned to serve members of the congregation in Glacier Hills and other senior communities, building and enhancing their pastoral skills. 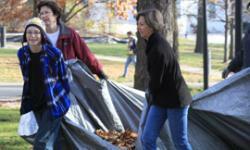 Already, they are having a noticeable impact on the life and work of First Pres. This cohort is a particularly accomplished and experienced team of young pastors. As of November 5, all of them will be fully ordained. Each one brings valuable prior experiences to our congregation. Blair Buckley worked for four years as Director of Youth and Children’s Ministries at a Presbyterian Church in Boulder, CO, and has a full year of CPE training. Eric Koenig holds an additional master’s degree, in theology, from Union Seminary in Richmond and has worked for many years with young people at Presbyterian camps and retreat centers. Dorothy Parks-Piatt has extensive experience as a writer and managing editor for a health-care media firm and several years of chaplaincy work. These experiences have helped them get off to a good start at First Pres. The resident ministry program is different this year because it includes responsibility for an innovative collaborative ministry for college students and young adults. Each resident spends about one-third of his/her time on campus ministry. Blair and Eric are focused primarily on our undergraduate program (Ukirk@UM) and Dorothy works more directly with young adults and the T2A2 group. One of our former residents, the Rev. Evans McGowan, serves as coordinator for these ministries. In 2017-19, First Pres will devote more of its resources to campus ministry than we have in many years. At the same time, we have ensured that the excellent peer education coupled with deep immersion in the life of the congregation that has always characterized our program will continue. Blessings abound, to our church, to our residents, and to the church at large.